"What do Joe Biden scented candles smell like? A fire that not only keeps you warm, but also makes you hungry? Kentucky Fried Chicken quickly sold out of a 5-pound log that it says smells just like fried chicken. "Introducing the 11 Herbs & Spices Firelog from Enviro-Log, the best way to make a fire smell less like fire and more like fried chicken," the chicken chain announced on Twitter, Tuesday. KFC says it's a mouth-watering aroma of Colonel Sanders' secret recipe. According to the item description, the limited edition $18.99 logs are made with 100 percent recycled materials. "We know the fire log smells great, but please do not attempt to eat it," said KFC on its website. The offer appears to have triggered a fried chicken-scented firelog frenzy because as of 10:30 a.m. Tuesday, the log was sold out. Darn, I was a going to get that for Clamato for Christmas. 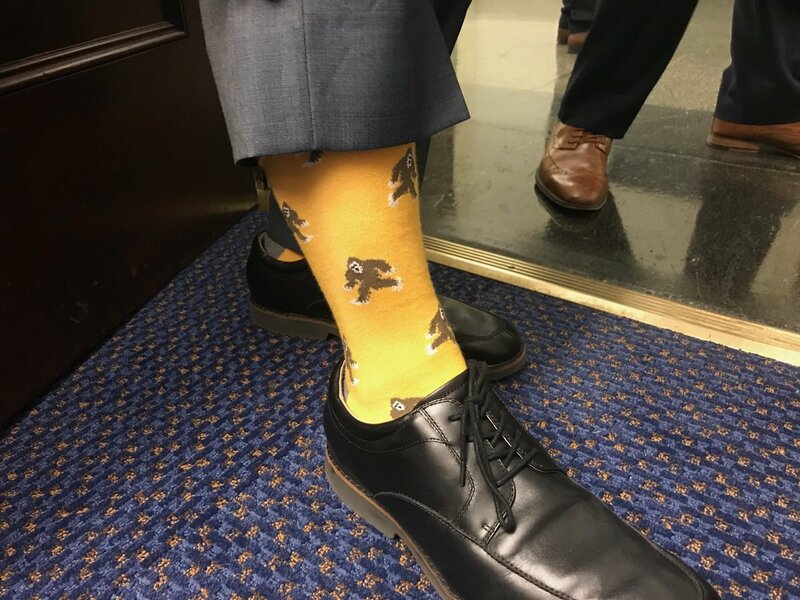 So Riggleman won and wore this socks to work today...give him credit, pretty funny. "If you like macaroni and cheese – and a lot of it – then you're not alone. And Costco knows that. The wholesaler is selling a 27-lb. bucket of one of America's favorite comfort foods. And if you're worried about getting through it quickly, have no fear: the product has a 20-year shelf life. But while the macaroni and cheese might last many years in the bucket, it has been gobbled up swiftly. Less than 24 hours after People magazine reported on the product, the Chef’s Banquet Macaroni and Cheese Storage Bucket is listed as "out of stock" on Costco's website"
Pulaski, a nobleman who joined George Washington's army and fought British troops in 1777, is considered a war hero in both Poland and the US. Scientists first found that Pulaski's skeleton had female characteristics about 20 years ago, but were unable to prove it was definitely him. But DNA testing has now confirmed the female skeleton was indeed Pulaski's.